The info sheet is quite thorough for the Olallie Area. As of 2006, the Estacada Ranger Station will no longer deliver hiker’s packages to Ollalie Lake Resort for pick up. There are a plethora of PCT Trail guidebooks available at bookstores. The PCT replaces the Oregon Skyline Trail in our District. The original 1920 Oregon Skyline Trail route is still in use from near Olallie Meadows to Olallie Lake. The northend is all re-routed to Clackamas Lake passing through the dry country east of the original routes. The purpose was to reduce conflicts with timber harvest and road building. This was achieved by routing the trail through dry country with timber of less or no commercial value. 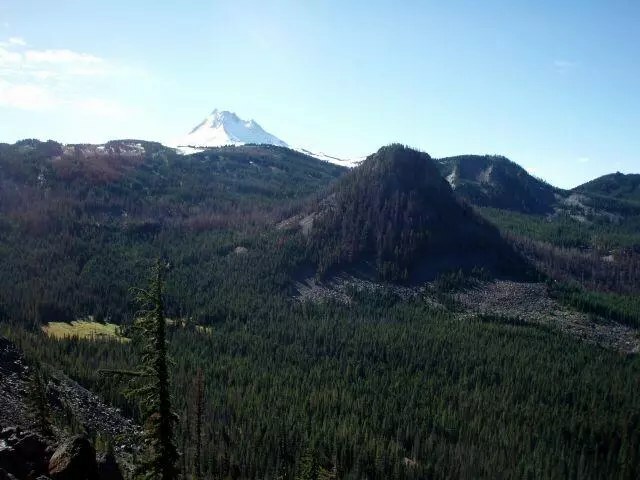 Remnants of the Skyline Trail and it’s Alternate Clackamas River and Rhododendron Ridge routes can still be followed in places and are more interesting. Unfortunately, they don’t connect with any routes enabling travelers to pass completely though the District as does the PCT. For Purposes of day hiking, the PCT in the Clackamas District has been split into 6 segments. In the northern part of the district, the trail exits the district just south of Timothy Lake and re-enters the district near Triangle Lake.